Pictured are the members of the 2017-2018 JM Yearbook staff. From left front row: Autumn Mason, Payge Howard, Breanna O’Bright, Savannah Weaver, Charlee Dunn, Ashton Kudlak, Lauren Garcia and Emily Beckett. From left back row: Scotty Gates, Emily Novotney, Maria Reager, Julia Schultz, Becca LeMasters and Haliey Dobrzynski. The staff submitted the 50h edition, titled “GOLDEN,” during the fall of 2018 to the NSPA for a super-critique. The student staff seeks the feedback in order to grow the program and continue on the quest to produce a high quality yearbook. NSPA offers critique services for newspapers, yearbooks, newsmagazines, literary magazines, feature magazines, and websites. As a level-two NSPA member, JMHS mailed a copy of the yearbook in order for it to be judged in five key categories: essentials, coverage, writing & editing, design, and photography. There are three levels of award ratings; the highest possible is an All-American rating, then a First Class rating, and finally a Second Class rating. While every publication submitted is carefully judged, not every entry receives an award rating. The judges are qualified professional journalists, as well as past and present advisers of award winning programs. Judges work with advisers and journalists to base critiques on current, nation-wide best practices in the field. “Being one of the senior staff members was an amazing experience because we all had the opportunity to educate the underclassman on the high expectations of our yearbook and ensure that the work being done was sufficient for a National Award winning book. This has been an experience I will remember with great pride.” 2018 Graduate Lauren Garcia said. Garcia was a four-year veteran member of the Pride yearbook staff. [The] book is certainly a complete history of JMHS for the school year. You have included just about everything that students have done on and off campus. The cover is attractive and the use of “GOLD” is well done throughout the book. Following the year chronologically is an interesting and different way to cover the areas of student life and academics. [The staff has] included good quotes in almost every caption. [The staff] is obviously enthusiastic and eager to produce a splendid book. “It has been amazing working on the yearbook last year and this year. I learned so much from the seniors last year, and I’ve been able to pass that knowledge to new staffers this year. Yearbook helps me to be more confident when meeting new people and trying new experiences. Winning these awards just proves that all of our hard work pays off.” Junior Rebecca LeMasters said. LeMasters is a second-year student staffer. The critique also includes suggestions on how to further improve the book. 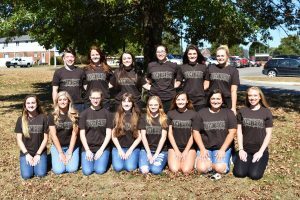 The 2018-2019 staff has already been working to incorporate those suggestions to achieve a higher rank for the 51st edition of the Pride yearbook.